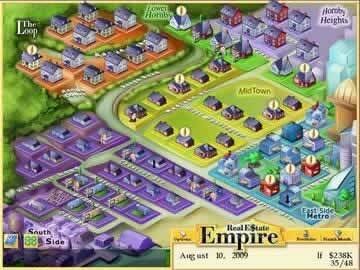 Real Estate Empire Game Review - Download and Play Free Version! Find Out What it Takes to be a Real Estate Mogul in the Game of Buying, Fixing, and Selling Real Estate! Thought provoking strategy game that maintains simple gameplay. Selling homes for a profit is tough and most offers make you little to no money. Buying homes cheaply is difficult and most offers get rejected. The single difficulty setting can make it hard for a new player. Wheel and Deal Your Way to a Real Estate Empire! Do you have what it takes to succeed in the cutthroat world of real estate? Find out today with Real Estate Empire, the latest greatest real estate simulation game! Start out with few assets and few prospects, and build a fortune through shrewd and careful business dealings. To win the game you'll have to earn more than four computer opponents, beating them out for the best properties and deals with tactful negotiation and clever strategy. Real Estate Empire proceeds along a daily and monthly time line, just like real life! As winter hits, take advantage of the slow real estate economy to snap up a great property at a bargain price. Increase value by fixing key parts of your property like flooring, carpets, plumbing, or the roof. When the weather warms up, so does the market! Sell off your property to the highest bidder to complete the "flip" and make a tidy profit. At the end of each month, you're presented with a financial statement showing earnings from salary and, of course, bills: maintenance costs, repair costs, and mortgage payments. Keep up or the bank will foreclose! You'll need to juggle payments, maintain manageable debt, and judge the perfect time to buy, sell, or wait for better opportunities. Navigate the perils and rewards of the real estate industry like a pro! Easy to Learn, Fun and Challenging to Master! Since Real Estate Empire seeks to emulate realistic conditions, the basic concepts of the game are familiar enough for anyone to understand almost immediately. At the same time, the game offers enough depth and complexity to interest real estate aces with the golden touch. Players with no background in real estate as well as real-world industry veterans can have equally enjoyable experiences with Real Estate Empire! Choose a Character to Fit Your Strengths! Real Estate Empire gives you a variety of unique characters to choose from to fit your playing style. Play as a general contractor and get discounts on materials and repairs, as a realtor who has the contacts and experience to get better offers for properties, or as an MBA who always seems to pick up a few extra dollars in every transaction. Each character comes with his or her own personal strengths and weaknesses: different credit ratings, salaries, skills, and personal savings. It's up to you to decide which one can help you reach the top! With Real Estate Empire, you've got a ticket into the rarefied air of the real estate industry! If you can handle the intensity and competition of this high-risk, high-reward business, you just might make it. Buy low, sell high: remember that simple first principle and you'll do fine out there! Download the game and give it a shot - will you create an empire? Real Estate Empire is a realistic property development game that will teach you about buying, selling, and fixing up houses. As the game begins you are offered a choice of character and profession. The jobs range from contractor to investor to real estate agent. The titles offer different perks but all come with a few drawbacks. For instance the real estate agent can typically get the most profit from a house; however, the agent pays the most for home repairs. The contractor, on the other hand, pays the least for repairs but does not always get the most money for his properties. This aspect of weighing costs and benefits seen in the profession selection is seen throughout the game. While playing you are constantly placed in situations that require you to weight out advantages and disadvantages. Once you pick your profession the game starts. 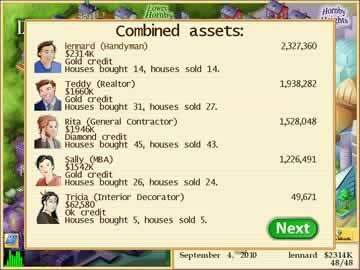 You play against 4 computer players and compete for properties as well as total assets. The game's time limit is based on months. During the month you can buy, sell, and fix-up properties. At the end of the month you collect your profession's salary and pay all bills. If for some reason you cannot pay a bill one month, the game has a credit option. You are able to buy on credit if you have a slow month or two. One important part of the game is being aware of the Market and Economy. There is a tool bar that shows the status of the economy. This is where the weighing out advantages and disadvantages comes back into play. It is important to make educated “weighed out” decisions based on how well the economy is doing. You may want to buy more houses in the winter months when the mortgage is low so you can resell them in the summer. These decisions can be tough, but are crucial parts of the game. To be successful, an awareness of the market and economy is especially important. As the months in the game progress your ability to buy houses will also progress. Start small and grow slowly in order to make the most money and avoid foreclosure. 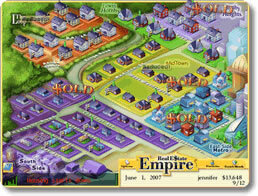 As far as gameplay is concerned, Real Estate Empire is very simple. The graphics aren't amazing and most of the game's actions are conveyed through messages and text. That being said the game is very fluid and entertaining. The simplicity adds to the game because it doesn't detract from the purpose of buying and selling homes for profit. One major annoyance of the game is the difficulties you may face try to buy and sell at a profit. Many times it feels as if you are getting the worst deal. If you try to purchase a home with a low asking price you typically get denied, and if you try to sell at a high price, the offers you get are insultingly low. Also the game doesn't have a difficulty setting. This makes the game very competitive from the start and it is difficult to be successful in your first game. All in all Real Estate Empire is a great simulation game about property development. The gameplay remains simple, yet the concepts and strategies can be complex. This game is challenging, realistic, and addresses many issues surrounding real estate, like the market and buying on credit. If you are interested in real estate development or challenging simulation games, Real Estate Empire is a game for you.